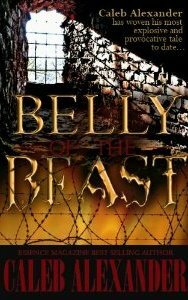 Fans of the HBO series Oz will appreciate the latest from Caleb Alexander, Belly of the Beast. Set in a Texas prison it is the story of Christian Alexander. Raised by his strict grandmother and a high performing student in his Catholic high school, Christian seems destined for greatness. With his own father in prison, Christian looks to his uncle for guidance. When that uncle is gunned down while walking a friend home, Christian descends into his own personal hell. With little regard for life, he goes on a killing spree that lands him in a maximum security prison. Coming from the streets of San Antonio, Christian has always had Hispanic friends. He learns quickly that there’s no such thing as friends of another race in prison. Separated from Enrique, his lifelong friend, Christian quickly aligns himself with others of his race. At first content to go along to get along, Christian doesn’t get involved in prison politics or race wars. When his best friend is attacked, his views change and he begins to organize the biggest and most well trained prisoners that the system has witnessed. A student of several world religions, Christian creates Umkhonto, whose sole purpose is to protect black prisoners from those that would do them harm. Backed by his counterparts in other parts of the yard, Umkhonto becomes a force with which to be reckoned. As the native Mexicans and U.S. Mexicans do battle on the yard for dominance, the Umkhonto quietly build up their numbers in preparation for the battle that is surely coming. Though not an extremely lengthy read, I found myself struggling to make it through this book, simply because of the subject matter. There’s a point when Christian rejoices over the number of black men arriving at the prison because to him it means more soldiers for his war. To me it simply meant more black men displaced from their families and more black women left behind to raise their kids alone. Is it hypocritical of me to enjoy shows such as Oz or the works of Iceberg Slim, yet question this storyline? Perhaps. Christian does have redeeming qualities and expands his mind enough to think beyond the prison walls. The fact that such an avowed separatist can find it in his heart to save a man of another race is enough to make me step back and question whether or not I’ve misjudged him. The author obviously took time to research prison life to create such a realistic account. What did you dislike about his book? There were a lot of characters and at times it was difficult to keep up with them. It would have been interesting to see what happened with the main character beyond the prison walls. I don’t know that a sequel is necessary, but an epilogue would have been sufficient.